A major feature of iOS10, released on September 14, 2016 is the iMessage App Store and Bobble is the only app from India to be featured on it by Apple’s editorial team. 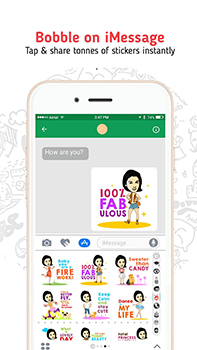 Bobble, an app from India that enables highly personal self-expression, has gone live inside iMessage, the messaging service developed by Apple Inc. for all iPhones, iPads etc. A major feature of iOS10, released on September 14, 2016 is the iMessage App Store and Bobble is the only app from India to be featured on it by Apple’s editorial team. Users in India, Russia, Sweden, Belarus, UAE, Ukraine, Pakistan and Hong Kong and over 150 other countries will now be able to enjoy real-time personalization of content with their own faces and relevant text. “We were contacted by Apple to feature as a launch partner for iOS10 less than a week ago. We grabbed this opportunity and worked overtime to meet the deadline. Visual communication on mobile has seen an exponential rise in popularity and our technology is unique in its ability to facilitate real-time personalization of content. No other product in the world offers this technology and we’re confident of adding value to the iMessage experience,” says Mohd Wassem, Co-Founder of Bobble. The integration with iMessage is an illustration of the fact that Bobble’s tech can be distributed widely. Its SDK can be integrated well with diverse apps. Its leadership stance in its category is also apparent from the fact that it enjoys the youngest user base in the world. 90% of Bobble users are 25 years or younger with its engagement and growth metrics being comparable to the top 150 Android apps globally. Its keyboard enjoys cult-like following among school and college students in India, and holds the same potential globally. 85% of Bobble users are organic and 65% of the total user base employs the app more than 5 times in the first week of downloading. Bobble's investors include institutional investors like SAIF Partners, and tech veterans like Sachin & Binny Bansal of Flipkart, Deep Kalra of MakeMyTrip, and Amit Ranjan of SlideShare. In the last 2 years, it has raised 3 rounds of funding.